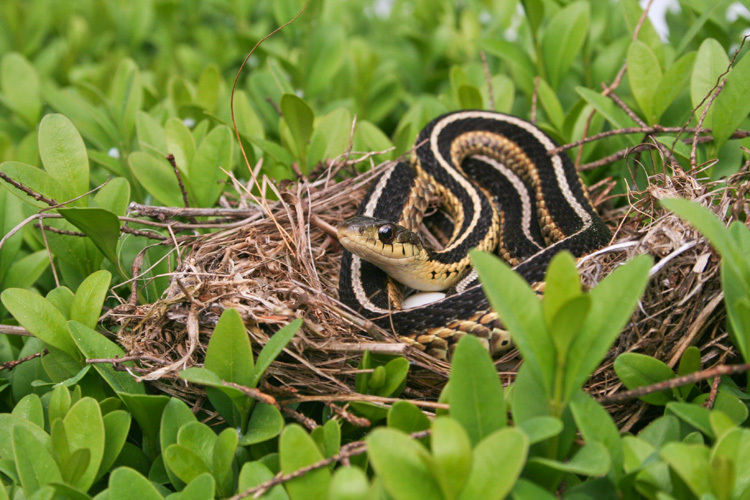 Posted on June 25, 2018 by Ryan D.
The Common Garter Snake (Thamnophis sirtalis), one of the most commonly seen snakes in Massachusetts, is also the official state reptile. They sport long, yellow stripes down the length of their bodies, which are typically green, brown, or even black, and average about 20-22″ in length, but can grow up to 54″ long. 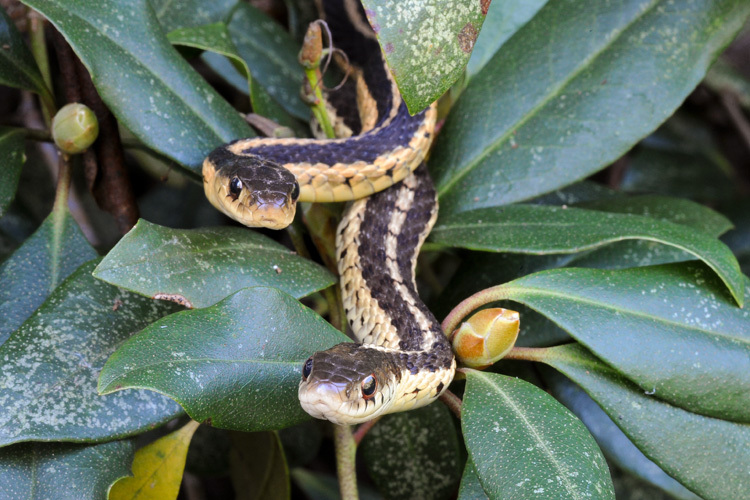 You may be startled to encounter one while out for a walk in the woods, basking in a patch of warm sunlight, but there’s no need to worry; garters are non-venomous and generally shy. More than likely, it will quickly dart away into the brush to escape. This quick retreat can make it difficult to differentiate a Common Garter Snake from the much rarer Eastern Ribbon Snake, which has additional burgundy stripes and a white eyespot, but if you’re unsure, garter snakes are much more common, and likely your best bet. 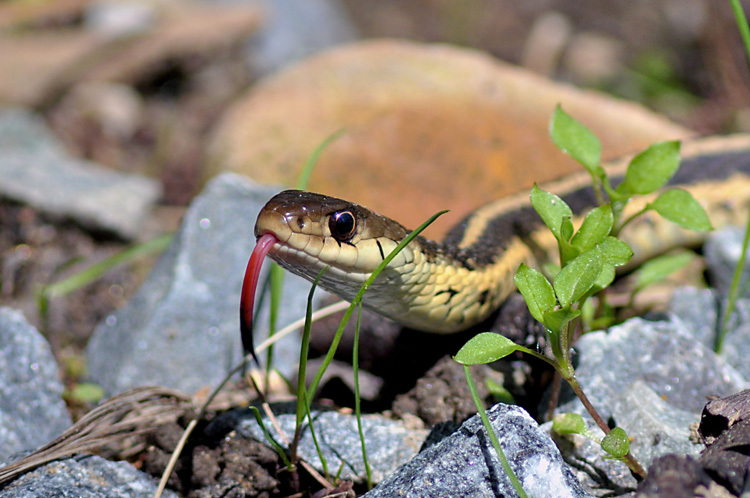 Garter snakes eat amphibians, fish, small mammals, earthworms, and sometimes insects. 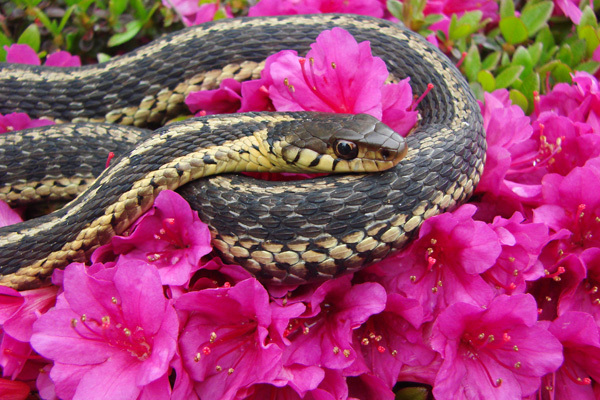 People often mistakenly call this snake a “garden snake,” because it can sometimes be seen in gardens. However, the name “garter snake” comes from the old fashion of wearing garters—strips of fabric that hold up stockings. Here are five photos of our state reptile from past entrants to our Picture This: Your Great Outdoors photo contest. The 2018 photo contest is now open, so submit your beautiful nature photography today! 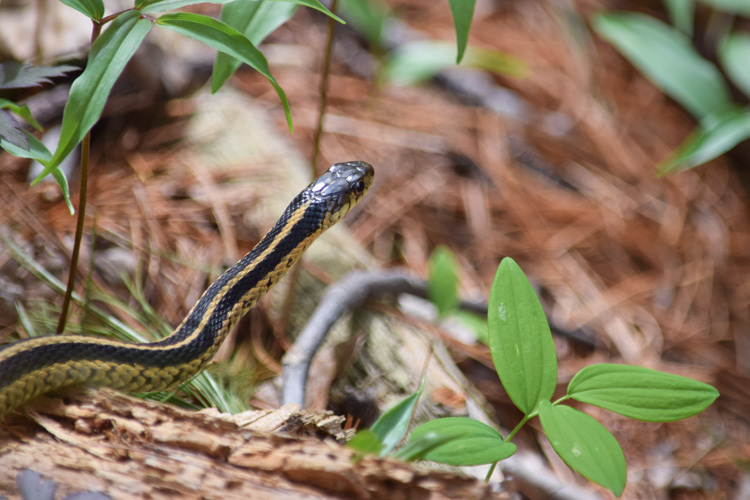 This entry was posted in Take 5 and tagged garter snakes, herps, photo contest, photography, snakes on June 25, 2018 by Ryan D..